In our fast-paced, ever-changing world, technology is disrupting the traditional research and development paradigm. More specifically, artificial intelligence is at the cutting edge of this disruption. The AI wave of disruption is not without challenges; scientific, behavioral, operational and regulatory mindset shifts are required to ensure successful implementation and large-scale adoption and application of AI algorithms within the drug development industry. Now is the perfect opportunity to immerse yourself in all that is new with regards to the real world application and successes of AI in R&D. 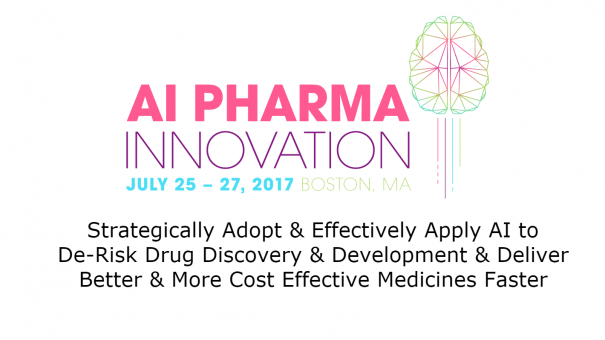 The AI Pharma Innovation 2017 (July 25-27, Boston MA) is the first and leading pharma-centric meeting dedicated to helping large pharma and biotech drug developers strategically adopt and effectively apply next generation AI technologies to de-risk drug development, enhance R&D productivity and deliver better medicines to patients faster. The diversity of focus areas covered in the meeting provides an opportunity to be part of the AI mindset shift. From case studies to roundtables, to insightful presentations, panel discussions and interactive workshops, there is much to learn from each other! Join experts, leaders and pioneers who are all capitalizing on AI technologies to boost innovation and make smarter decisions throughout R&D. Click here to view the full event guide to find out how AI will play the most important role in the future of pharma.